Hello! 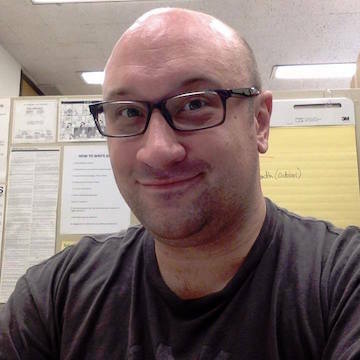 I’m Rob, an innovative, high-tech web developer and patron-focused librarian living and working in Chicago, Illinois. My professional interests include web development, information architecture, digital archives, storage technology, app development, and scalable deployment. I have been working in librarianship for eight years. I'm a reference librarian working for Chicago Public Library at the Carter G. Woodson Regional Library. In my daily duties, I provide reference service, order new materials, weed old material, teach computer classes, plan and host library programs. I enjoy my work, especially when someone walks out happier and smarter than when they walked in. It's a great feeling. In addition to my Master's degree in Information & Library Science from Pratt Institute, I also have a Bachelor's degree in Computer Science from New York Institute of Technology. I am equally comfortable in a variety of computer operating system environments, such as Windows, Mac OS X and Linux. I am also a web and application developer, specifically using HTML, CSS, PHP, C, C++, Objective-C, Python, SQL and more. I'm of the opinion that smart technology, well-designed and properly applied, can revolutionize librarianship and make us more relevant than ever. Chicago Filmmakers, a not-for-profit media arts organization that fosters the creation, appreciation, and understanding of film and video as media for artistic and personal expression, needed a website redesign and retooling. My partner and I were contracted to take the design which Chicago Filmmakers had commissioned and turn it into a complete Drupal theme, using custom content types, Views, Fields, Panels and other tools. Chicago Public Library launched its award-winning Maker Lab at the Harold Washington Library Center in July 2013 and I was lucky enough to work there for its first two years. I taught people to design and create using our 3D printers, lasers (for cutting and etching) and vinyl cutters. I've taught and helped teach classes on 3D printing, decal making, knitting, flower arranging, Arduino and Raspberry Pi programming and more! It was an absolute blast working there and I learned just as much as I taught. It was incredible to see the look on someone's face when you showed them how to turn their idea into a real-world object. While I've since moved back to my regular assignment, I'll always be grateful to the staff for giving me such an amazing opportunity. 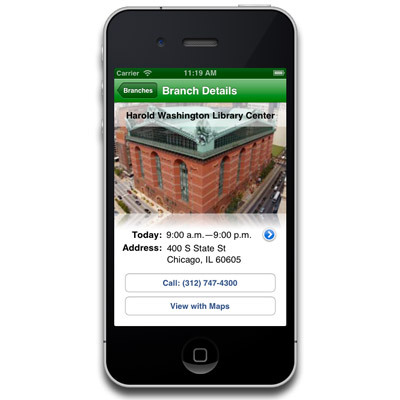 I wrote iCPL in 2012 to demonstrate the power of mobile apps to CPL's administrators, who were at the time in the planning stage of a project to overhaul CPL's online catalog and web site (then running on a long-outdated content management system). The ideas behind writing my own iOS app were to show that libraries could build their own digital services, that native apps could provide just as compelling an experience to users as a desktop web site and to teach myself the Cocoa Touch frameworks for iOS. Ultimately, CPL chose in 2014 to contract with BiblioCommons to provide both their new online catalog, web site and mobile apps instead of building their own services, but from what I've seen of them, BiblioCommons does amazing work and their mobile apps are friendly, fast and powerful, so everyone came out better in the end. When I started in my current position, I was surprised to discover that the staff was printing out our daily router (a list of books requested by other branches) and separating them by subject by physically cutting the sheets up with scissors. However, this was terribly inefficient and a lot of requests fell through the cracks. I put together a tool which allowed the staff to print off subject-oriented router reports that were a lot easier on the eyes… and didn't require a pair of scissors to split up. 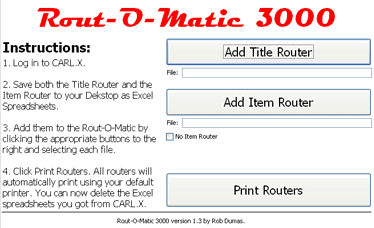 The Rout-O-Matic isn't pretty, but it gets the job done and it's become an invaluable tool at my library, saving the staff thousands hours since its creation. My co-workers and I use it every day and there's no way we're going back to the old way of splitting up the router. My Helpful Hints for Job Searchers packet started out as a little one-page sheet with a few tips I wrote up and gave to patrons when they came into the library asking about finding a job when the economy was quickly contracting in late 2008. Over the following few years, it expanded into something really amazing. The Helpful Hints became so popular that in 2010, it became the basis for a rewrite of the “Especially for Job Searchers” section of Chicago Public Library's web site. It's by far the largest, most sustained impact I've been able to affect upon the system and the populace and I'm still immensely proud of it. This is a presentation on Git I gave to the Chicagoland Library Drupal Group in October 2013. This is an earlier, "lightning talk" version of the presentation above. I gave this talk at the Code4Lib conference in February 2013. Although there was a great deal I had to cut out – lightning talks can be no more than 5 minutes long – I'm actually quite pleased with how it turned out. I got a lot of positive feedback from it, as well. You can also follow along with the slides for this talk. 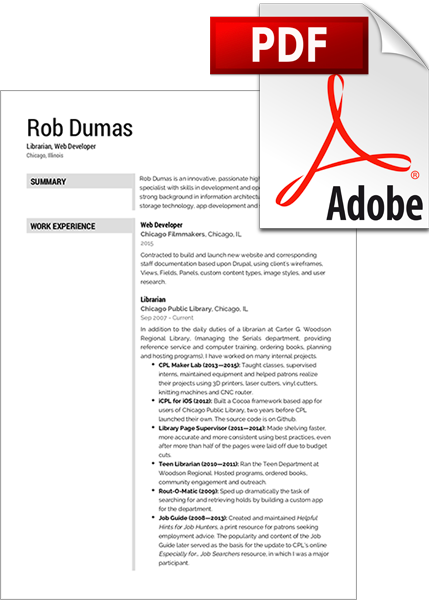 If you're interested in my full résumé, just click the image to download it as a PDF. Copyright © 2013—2018 by Rob Dumas. All rights reserved.